Ping Viewer is the graphical user interface for the Blue Robotics Ping Altimeter and Echosounder. The application allows you to connect, configure, view data, and record data from a Ping device. Note: This documentation is a work-in-progress. Content may not be accurate and is subject to change. Download this .zip file, open the download location in the File Explorer, and extract it. Open the application by double clicking the executable file (pingviewer.exe). Windows will ask you to trust the software; click More Info → Run Anyway. Download this .dmg file, and double click it to open. Drag the Ping Viewer application icon to your Applications folder. Open the application by double clicking the icon in your Applications folder. If you get an 'unidentified developer' notification when you try to open the application, you may adjust your security preferences to allow the application to run. Visit System Preferences -> Security and Privacy, click the lock and enter your password to make changes, then click 'Open Anyway'. Download this .AppImage file. Edit the permissions of the .AppImage to have executable permission with the command line: chmod +x ping-viewer-linux.AppImage. Open the AppImage by double clicking it, or execute it from the command line: ./ping-viewer-linux.AppImage. Remember to run the commands in the same path where the Appimage file is. To begin using the device, connect it to a USB - UART converter that operates on 5V like this Blue Robotics adapter. Then connect the converter to your computer's USB port. The Ping Viewer application should automatically detect your device and begin displaying data. If it does not, check the FAQ and Troubleshooting guide. Visit the Connection Settings menu for more connection options. The Blue Robotics Ping Echosounder is a 1-dimensional sonar that measures the distance to objects underwater. The device emits a brief 115 kHz acoustic pulse from the transducer at the face of the device. The device then measures the strength of returned acoustic energy and the amount of time for the returned energy to reach a significant level. The sound wave travels through water, and reflects or 'echos' off of solid objects, and travels back to the device. The device then calculates the distance to the solid object with the equation distance = known speed of sound in water * (measured time for echo to return / 2). See the Wikipedia articles on Echo sounding and Fishfinders for more information on how the device operates. The Ping device processes the data and attempts to lock on to the most likely target in view of the device. The algorithm for determining the target considers return strength (the strongest return is likely the target) and past measurements (ie. a low pass filter). The Ping device algorithm also produces a confidence measurement corresponding to the probability that it has correctly identified the target. In noisy environments presenting a lower signal-to-noise ratio, the confidence of the target lock may be reduced. The device outputs the distance to the most likely target with the associated confidence. The device additionally outputs Profile samples, which consist of 200 signal strength measurements at regular distance intervals across the current scan range. These Profile samples provide a more detailed view of what might be in front of the Ping device. 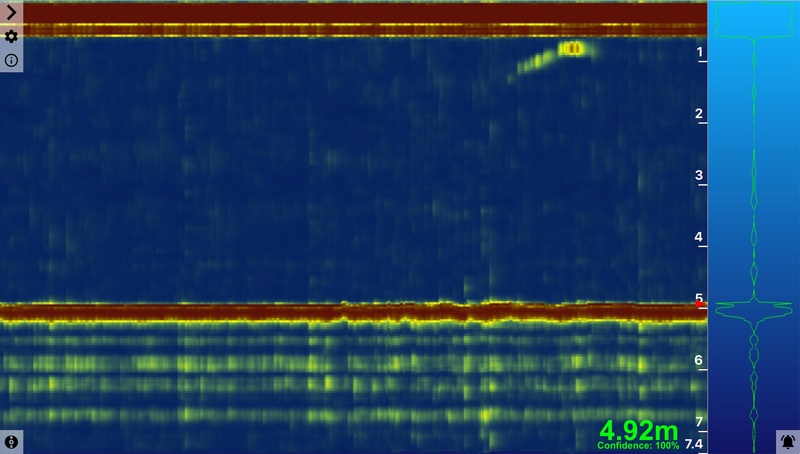 With the Profile data you can see fish in the water, determine if the device is picking up multiple reflections or interference from other acoustic devices, and possibly differentiate between eg. bare sand and plant life. The Distance Readout displays the distance to the target in the most recent measurement. This is the distance to the seafloor in depth sounding applications. The size of the distance readout can be moved and adjusted. The Distance Axis is labeled with bold numbers on the right-hand edge of the Waterfall. This axis represents the distance from the Ping device transducer. The axis runs vertically down the screen, with the face of the transducer (zero distance) located at the top of the window. The deeper/farther an object is from the transducer, the closer its return will appear to the bottom of the window. The Distance Axis scale automatically adjusts to display the current scanning range of the Ping device. There is an orange arrow on the Distance Axis indicating the distance to the target in the most recent measurement (this is the same as the Distance Readout). The Return Plot displays the return strength vs distance of the most recent Profile sample. The plot displays the measurement of only a single dependent variable (return strength), and is simply mirrored for ease of viewing. Stronger returns appear as wider traces. Note You may observe a very strong return at the top of the screen (at zero distance, essentially touching the device); this return is from the Ping device itself. When the Ping device emits the acoustic pulse, the device is still vibrating or 'ringing' like a bell when it begins measuring the return signal. This residual energy in the vibrations of the Ping device body is picked up as a return signal until it decays away. The Waterfall is a three dimensional plot that occupies the main portion of the application window. The Waterfall plots consecutive Profile samples (distance running vertically and color indicating signal strength). The horizontal axis is time; new data is displayed on the right edge of the Waterfall as older data moves to the left. The color scheme (gradient) of the Waterfall can be customized. See here for instructions to switch between meters and feet for the application display. To adjust the update rate and other Ping device settings, visit the device configuration page. As the sound wave travels through water, it may encounter several 'reflective' objects like fish, or air bubbles. These smaller objects will also produce a return signal as energy is reflected back to the device. The energy that returns from these smaller objects is usually much less than the energy reflected off of a larger solid object like the sea floor.